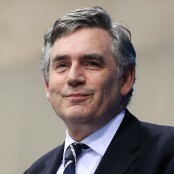 Editor's note: Gordon Brown served as Britain's prime minister between 2007 and 2010 after a decade as the country's finance minister, or chancellor of the Exchequer. In July this year he was appointed as a United Nations Special Envoy on Global Education by Secretary General Ban Ki-moon. Islamabad, Pakistan (CNN) - Pakistan has a new heroine and a new cause - a girl's right to education - and after Friday's announcements from the Pakistani government that they will adopt new measures to get every child into school by end 2015, that cause has a timetable and a deadline for delivery. Everywhere you go in Pakistan you find people talking animatedly about the 15-year-old girl, Malala Yousafzai, who was shot by the Taliban last month. A rickshaw touring the streets of Islamabad has a slogan posted on it: "Malala for education and peace." Go to the local girls' school and every girl seems to have written either a poem or a song, a letter or a card to Malala. Listen to the politicians and every speech is laced with references to the courage of Malala. Meet civil society organizations and they will tell you that the audience for their educational demands has risen markedly over the last few weeks. It seems that Malala's courage has awoken Pakistan's silent majority who are no longer prepared to tolerate the threats and intimidations of the Pakistan Taliban. Can Pakistan convert its momentary desire to speak out in support of Malala into a long term commitment to getting its three million girls and five million children into school? Can the politicians, long-criticized for a failure to deliver, find the teachers, the classrooms and the reading materials to give millions of children a basic education?